Memory foam mattresses were the next best thing when they were introduced to the world in 1991. They rapidly became popular because they evenly distributed support, relieving pressure on joints and keeping the spine aligned. This is what pocket coils did 90 years before, and what waterbeds did in the 1970s. But memory foam did it better than the coils and without the extra weight and trouble of setting up a waterbed – besides, you did not have to worry about memory foam leaking. But there was a problem. Memory foam mattresses quickly gained a reputation for being hot. Why? Extra ingredients were added to polyurethane foam to give it memory by making it eat sensitive. When the foam absorbed body heat, it became soft – the warmer it was, the softer it became. Since larger parts of the body had more heat and were heavier, they sank in further. The foam stayed higher under the smaller parts, continuing to give them support. The result: even support. But this meant the memory foam became hot. With users complaining about the heat, memory foam manufacturers had to find a way to cool the mattresses. The natural way was with cool air, but how could they get air through the mattress? The original memory foam was closed-cell foam, which kept air from passing through. Taking a cue from articulated foam, used for marine applications since it lets water pass through, foam manufacturers developed open-cell memory foam. This let some air filter through the foam. It did make memory foam cooler – at least not as hot. It also made it a little lighter. By now, almost all memory foam is open-cell, which makes claims of how cool they are compared to “traditional” memory foam essentially meaningless, since hardly any of it is closed-cell foam anymore. The real question should be how a foam compares to others currently in use. However, even with open-cell memory foam there is still a heat problem. Another cooling solution is infusing the foam with heat-conducting materials. There are two basic kinds of these infusions. One is some substance such as gel or graphite to absorb the heat. Gel is the most common. Some brands have gel in all their top layer memory foam. The other is phase change materials, (PCMs) which are designed to keep the temperature within the desired range by absorbing a lot of heat at the upper end of the range and releasing a lot of heat at the lower end. Gel does absorb a lot of heat, at least initially. Several mattress experts have noted the limitations of this absorption. Unless the heat can be conducted to where it will exit the mattress, it reaches its limit and absorbs no more. PCMs also have their limitations. At the top of the temperature range, they can absorb only so much heat and no more. The most efficient way for foam and gel to release their heat is aeration – transfer the heat to air moving through the mattress. To do this, air needs a pathway to flow through; otherwise, it will also become heat saturated. Several means of aeration have been tried with differing results. They include breathable coverings, open-cell foam with larger cells, pores, convoluted foam(s), and cut or molded air channels. Even today, more than a quarter century since memory foam mattresses began, a common complaint about them is the heat. In the mid-1990, Relief-Mart developed the 3-layer design in the Tri-Pedic for a faster initial response, a concept later adopted by TEMPUR-Pedic in its Cloud Collection. The lighter memory foam in the top layer also reduced heat retention. Later, to combat heat retention with moving air, they designed a whole-mattress aeration technology, the Airflow Transfer System. In 2006, Relief-Mart filed a patent application (approved in 2008) for a “Ventilated Mattress and Method,” now known as the Airflow Transfer System. The proposed method was vertical pores of at least ⅛” diameter through the upper layers and the top surface of the support core layer configured to allow air to flow horizontally to and from the side of the mattress. The vertical pores are drilled or punched through the upper layers after they are attached to each others so they line up for unimpeded airflow. Originally convoluted, the top surface of the base was modified to have straight cut channels. This is to keeps the peaks of the convoluted foam from collapsing and closing off airflow. It also make mattress sagging less likely. The Airflow Transfer System has been shown in testing to have multiple times the amount of air flowing through the mattress than other airflow means, from three times some systems to 100 times open-cell foam alone. This is demonstrated in a video in which volumes of air are measured. The reason for this efficiency is that this is a system involving the entire mattress, not just one component. The cover, the comfort and support layers, and the base are designed to be integral components of the system. The Kool-Flow cover is the beginning and end of the Airflow Transfer System. Micro-vents are knitted into the fabric to let air flow through more freely. The closest parallel in competing brands is ports in the foam edge support rails panels of Simmons Beautyrest models to let air flow into and out of the pocket coil support base. In the Kool-Flow cover, the whole fabric is dotted with micro-vents, providing access to airflow all the way around. This ensures that air can enter and exit wherever internal air pathways meet the cover. 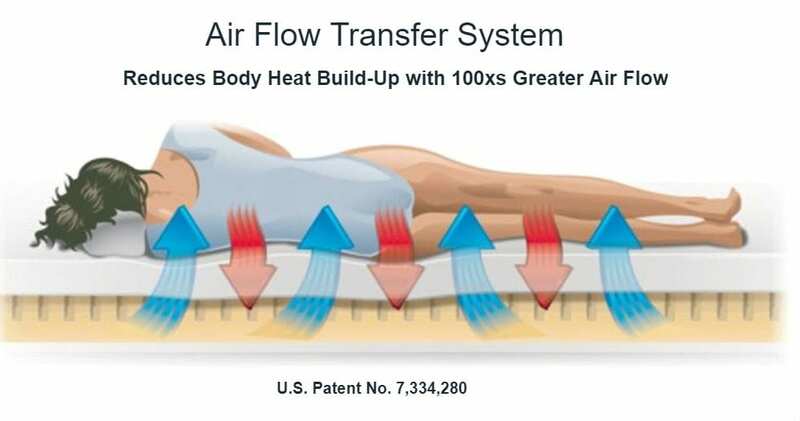 The Airflow Transfer System is used in several mattress models and series in the Selectabed family of mattress brands (Selectabed, Air-Pedic, Tempflow, and Snuggle-Pedic), therefore the number of upper layers varies. The Snuggle-Pedic Mattress has only two layers, so there is only one upper layer – the Comfort Layer. 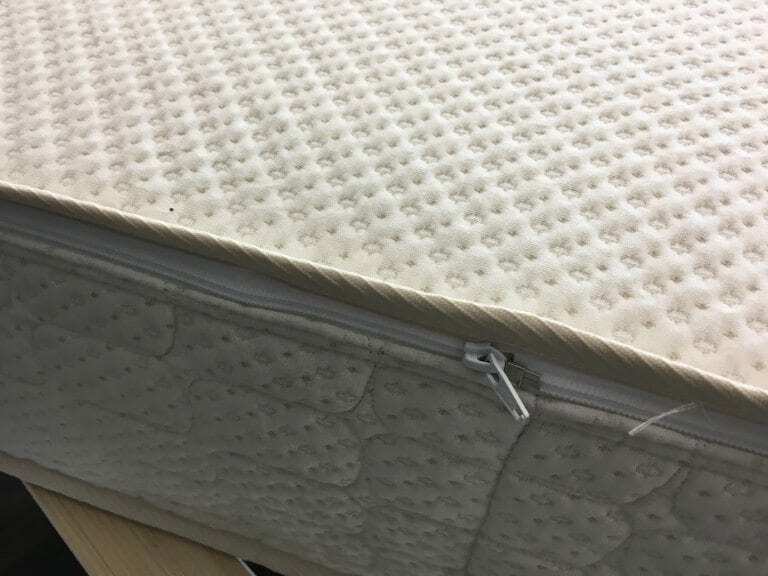 Except for Air-Pedic adjustable air mattresses, Selectabed and Tempflow mattresses have two upper layers each: Comfort Layer and Support Layer. Air-Pedic airbeds have from two to four foam layers (Comfort and Support) atop the air chambers. 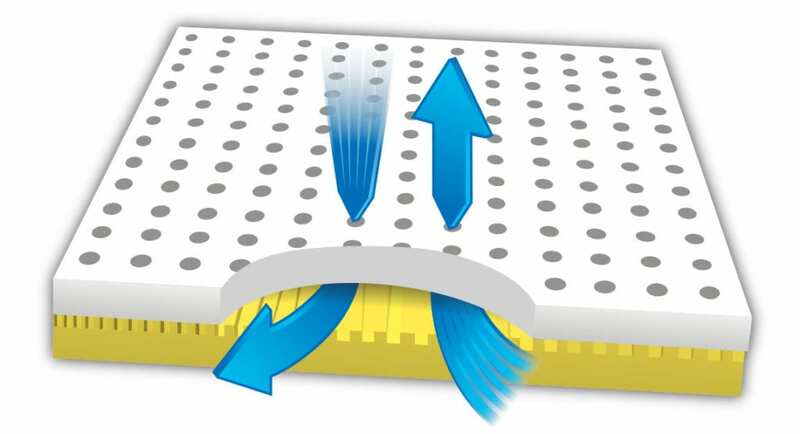 In mattresses with the Airflow Transfer System, the upper layers are put together and perforated. This makes airways which go all the way through from the top to the bottom. This provides an unhindered vertical flow of air. The top surface of the base is scored with squared-profile channels for horizontal air flow. This connects the vertical pores to the side panels of the cover. 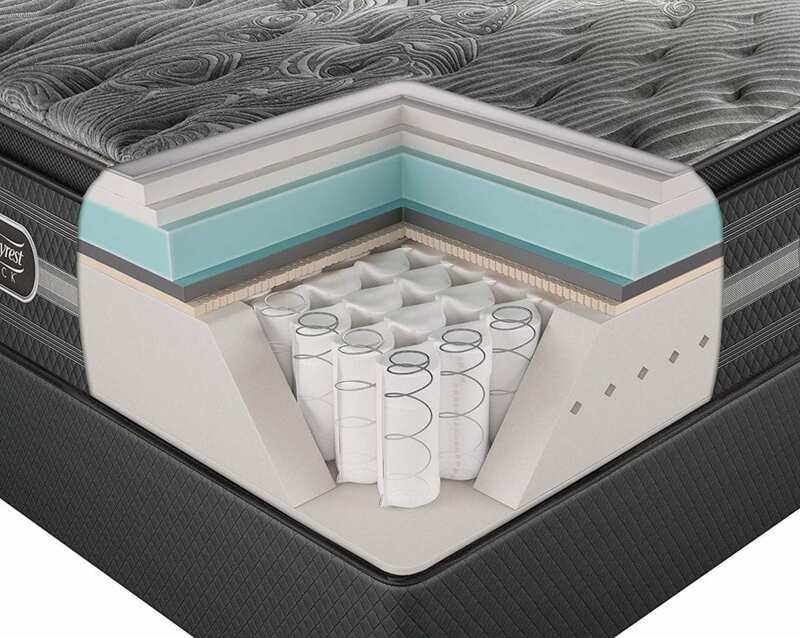 Some models, such as three of the Tempflow mattresses, have two base layers, For these, it is the upper base layer which is scored and renamed the “Airflow Channeled Layer.” In Air-Pedic models with the optional Airflow Transfer System, since the support base is air chambers, it is the foam Support Layer which has the air channels. Aside from the demonstration, how do we know that the Airflow Transfer System (ATS) works? Customers tell us it does. In reviews on Yelp, Beds.Org, Goodbed, Amazon, Reseller Ratings, Viewpoints, and other venues, mattress owners tell how their memory foam mattresses with ATS are not hot like their previous mattresses. One even said his Tempflow mattress was cooler than the equivalent TEMPUR-Pedic Breeze model. If you want to sleep without overheating, you can beat the heat with a mattress that has the Airflow Transfer System.